Japan's capital is as hectic and eclectic as everyone assumes. These big, bustling, neon-lit streets are home to a treasure trove of experiences to uncover. From the vast array of shops, restaurants, and nightlife in Shinjuku, to the colourful streets of Harajuku, home to the most eclectic of fashions and plenty of sweet treats. Or, when you tire of the hustle and bustle, you can visit the quieter, more historic corners of the city, such as Senso-ji Temple in Asakusa, or Meiji Jingu Shrine, just a stone's throw over from Harajuku. There's also museums and galleries aplenty, as well as numerous parks and gardens. Don't forget to check out Tokyo Tower, and the iconic Shibuya Crossing. Tokyo is such a vibrant, energetic city, and you'll never run out of new areas to explore, as it sprawls out for miles in every direction, and while it's very modern overall, there are many historic sights too. The subway is easy to navigate though, and there's also plenty of great options for solo travellers, including capsule hotels (a cheaper option in a notoriously expensive city) and restaurants specifically designed for solo dining. The Thai capital is a sprawling mass of motorbikes and buildings ranging from the splendid to the simple. It's a city with a much older feel to it than some of the more modern designed Asian capitals, which makes sense given that it's been here in some form for hundreds of years. The river is the backbone of the city, and taking a river boat is usually a faster way of getting around than the crowed streets, notorious for traffic jams. The city centre has a wealth of historic sights, including the Grand Palace, Wat Pho, and Wat Arun. Yet these exist side by side with street markets, and the simple, self-built homes on the canals, wroth checking out on a boat tour. Shopping and eating out is famously cheap in Thailand, but I'd recommend exploring the streets yourself, and avoiding Khao Sok Road, which is a backpacker district, full of bars, clubs, and hostels - not much local culture! Or seek out a different cultural experience in Chinatown, or experience a more modern side of the city in one of its many rooftop bars, the Sky Bar being the highest and most famous. Beijing has more historic sights, but Shanghai is a representation of modern China. No trip to China is complete without visiting both cities, but I preferred Shanghai overall (perhaps because I spent longer there and was visiting a friend), with its more international outlook, and plenty of vibrant neighbourhoods to explore. The Pudong skyline, as seen from The Bund, is the most iconic part of the city, and just behind The Bund is East Nanjing Road, with every shop and restaurant you could possibly want found along it somewhere. There's also an abundance of vibrant nightlife, so the city has something on offer at every time of day. Yet amongst this modern, cosmopolitan city, there are also small, independent retailers, such as in Tianzifang, and important cultural temples, including Jing'an and the Jade Buddha Temple. Shanghai doesn't have the sorts of 'must-see' sights as other parts of China, but it is a lively, diverse city, with plenty on offer to see and do. Taipei, and Taiwan as a whole, surprised me with how much I enjoyed my trip there. There aren't lots of well-known sights, like in some other cities, but it's such a friendly, welcoming city, where I felt very safe, and where it was relatively easy to navigate language barriers (locals either spoke good English, or were patient enough to try to help anyway, something that was less common in places like Japan and China). Like many of the other cities on this list, I loved the mix of modern and historic, with places like the Taipei 101 skyscraper alongside the Chiang Kai Shek Memorial Hall. There's also lots of independtn shops, and street markets, including the Farmer's Market in Taipei Expo Park, and Shilin Night Market. There's also plenty of options for day trips out of the city too, and public transport is very easy to navigate. And don't miss out on hiking Elephant Mountain for sunset too; it might be crowded with other tourists, but it's definitely worth it! This is probably the most international city on the list, as Malaysia is a very international country as a whole, which made it incredibly easy to navigate for an English speaker such as myself. As well as the local Malay population, Kuala Lumpur has Chinatown, Little India, and the Arabian Quarter, showcasing its multicultural population, as well as European style architecture that is clearly from colonial times. 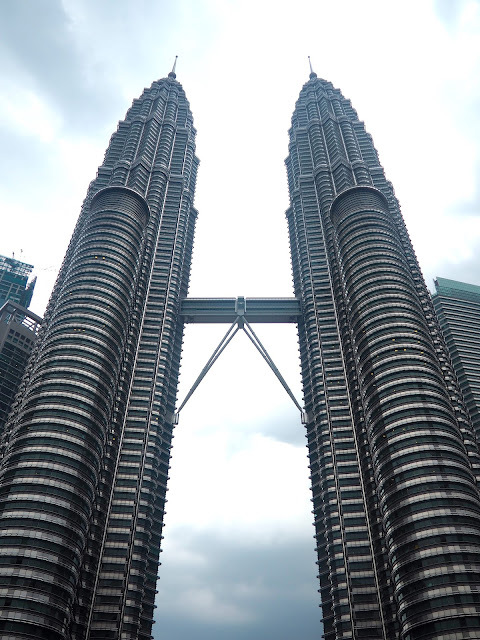 It's also a very modern city, with of course the huge Petronas Twin Towers serving as the number one attraction to visit, with the shopping centre inside. There's also exciting nightlife in its many sky bars, or a wide variety of street food and markets to explore. As well as being multicultural, its a multi-religious city too - learn about Islam at the National Mosque, or Hinduism at the Batu Caves. I mentioned Edinburgh in my European list, so how could I finish my Asian list without throwing in an honourable mention for my home of two years, Hong Kong? I adore this city for so many reasons. Its multicultural population and good public transport makes it easy to navigate as an English speaker. Although it can be an expensive place to live, there are lots of cheaper options for eating out, or bargains to be haggled at the many street markets. In its chaotic streets you can find designer brands alongside hand made goods, fine dining restaurants alongside street food, modern skyscrapers on the island next to ramshackle housing in Kowloon, and tiny, traditional Chinese temples alongside some of the craziest nightlife I experienced in Asia, with people partying in the streets until sunrise every weekend. And although it's an urban, cosmopolitan city at heart, it's just a stone's throw from some spectacular natural scenery, in its country parks, islands, and beaches.